Clarity of mind and power of thoughts; Trusting intuition and developing psychic abilities; Learning to conect with the non-physical realm. All the elemental forces combine to create change; Healing through change and transformation, growth and renewal; High energy stones to activate the higher chakras. Clearing and releasing old patterns;Letting go of unwanted possessions and beliefs; Creative force, passion, sexuality. Grounding, calming, nourishing and strengthening; Connection with the life force of the Earth; Survival issue; prosperity. Cleansing, purifying, nurturing; Emotional balance; Learning to love; Relationship issues. 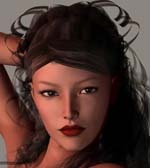 I was born at DAZ Studio. They created me with utmost care and that is why I am the hottie that you see today. My interests include posing, trying out cute outfits, and more posing. test Just click outside the pop-up to close it.